The Citan will be available in three different sizes. BERLIN – Daimler has released details of the Mercedes-Benz Citan delivery van, ahead of its unveiling at the IAA commercial vehicle show in Hanover, Germany, in September. The van is the first vehicle to result from two years of cooperation with Renault. The Citan, which shares technology with the Renault Kangoo, will go on sale in the third quarter, Daimler said. Mercedes aims to capture a 4 percent to 5 percent market share of the European small-van segment with the vehicle. The market totals about 700,000 vehicles a year. The Citan will compete with vehicles such as VW's Caddy. Daimler and the Renault-Nissan alliance agreed in April 2010 a partnership aimed at cutting costs. In addition to the van project, the automakers will share development of next-generation models of Daimler's Smart and the Twingo minicar made by Renault. Nissan's Infiniti brand may also use small-car technology from Mercedes for a new premium compact car. 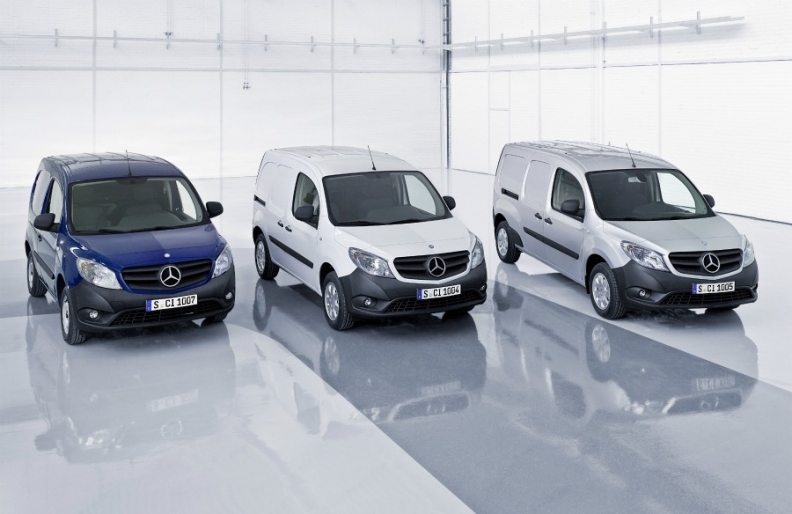 The Citan adds a vehicle designed for inner-city deliveries to Mercedes's van lineup, which includes the larger Vito and Sprinter models. According to Daimler, the Citan will be available in three lengths: 3940 mm (155 inches), 4302 mm and 4710mm and customers will be offered a choice of three turbocharged diesel direct-injection engines with outputs between 75 hp and 110 hp, and a supercharged gasoline engine generating 114 hp.